Atlantic Beach is blessed with one of its residents. In June of 1934, the parents of James Newman Willis, III, brought newborn “Cap’n Jim” home from the hospital to Atlantic Beach. He’s lived here ever since. There is no one better qualified to write Atlantic Beach’s history. “Cap’n Jim” is trained and spent his work career as a researcher. Below, in installments, is “Cap’n Jim’s” work in progress. Part one is ready for reading. Photos from the Atlantic Beach archive are included to enhance your reading adventure. Enjoy. A Brief History of Atlantic Beach, N.C. 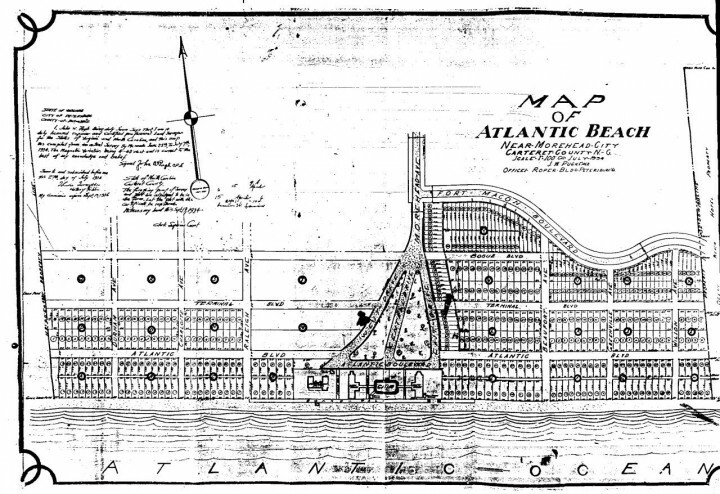 The resort that is now Atlantic Beach, North Carolina was first visualized in the 1870’s by Appleton Oaksmith, one of the most colorful characters of mainland Carteret County. His vision for east Bogue Banks was that of a new resort by the sea. He first chose Fort Macon, but was unsuccessful. He then turned his attention to the area which now comprises all of Atlantic Beach and a portion of east Pine Knoll Shores. He soon acquired title to all of this property in the names of two straw ladies, his wife, Augusta, and her sister, Ellen Mason. But alas, Oaksmith was not to achieve his dream, for on July 4, 1879 he lost four of his daughters in a tragic accident and lost the will to fulfill his dream. It remained for John J. Royal of Morehead City and Winfield S. Chadwick of Beaufort to begin the construction of Oaksmith’s vision. In 1887 they built the first bathing pavilion on Bogue Banks in the location of present day Club Colony. 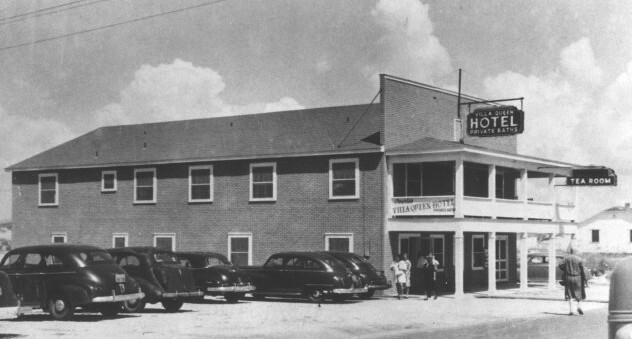 They had a ready-made clientele that Oaksmith did not visualize, the patrons of the new Atlantic Hotel across Bogue Sound in Morehead City. The old Atlantic Hotel in Beaufort had been destroyed by the hurricane of 1879 and in 1880 the Morehead City Hotel Co. constructed the “New Atlantic Hotel” in Morehead City at the terminus of the Atlantic and North Carolina Railroad in order to make hotel accommodations in the area more convenient for the former patrons of the old Atlantic Hotel. They were quite successful, since many of the old Atlantic customers became patrons of the new hotel. Many of its guests desired to bathe in the ocean surf, but there was no bathing pavilion on the ocean side of Bogue Banks to accommodate them. So, Royal and Chadwick provided one, and the resort of Atlantic Beach was begun. Patrons of the Hotel flocked to the newly accessible beach in droves, and a brisk ferry trade to the Banks ensued. In 1898 Royal and Chadwick split their holdings, with Chadwick getting the east portion and Royal the west. Royal then built his own pavilion on a much grander scale in the location of today’s Sportsman’s Pier. This was the beginning of the development that became known eventually as Money Island Beach. After Royal’s death in 1909 the development passed through many hands, and a hotel was eventually built near the present site of Courie’s Villa. This new beach development, begun by Royal, thrived over the years while the original pavilion declined in popularity. This resort had many names over the years including Atlantic View Beach, Ocean Beach and finally Money Island Beach. In 1922, another bathing pavilion and ballroom was opened just east of the present Triple-S Pier by V. Asbury. The development was known as Asbury Beach and the following year was reserved exclusively for blacks, since these were the days of segregation. In 1926 an event occurred that signaled the eventual decline of Money Island Beach and the demise of Chadwick’s and Asbury’s pavilions. In that year a group of Morehead City and Beaufort investors formed two corporations, one to buy and develop a new resort on Bogue Banks and the other to build a modern bridge across Bogue Sound to this new development. 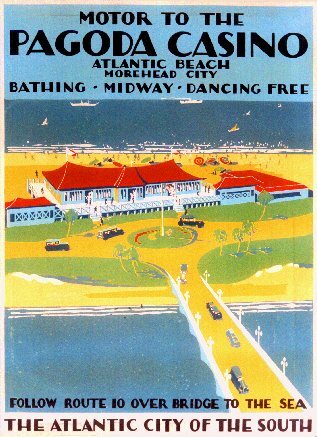 By the summer of 1928 both goals had been achieved and the new “Atlantic Beach” opened for business. This new resort was located west of the Royal Pavilion in an area that became known as the “Circle”. Initially it contained two bathhouses (formerly known as bathing pavilions), one each for men and women, separated by a large ballroom style dance hall called the Pavilion. There were also several accessory buildings constructed nearby along with an office building in the center of unopened West Bogue Boulevard at its intersection with West Drive. All structures were oriental in design, and referred to as Pagoda, a feature that distinguished them from all past and future construction. More importantly, this new beach was accessible by motor car while the others were not. Thus, the new “Atlantic Beach”, which could be reached by motor car, prospered, while the older less accessible developments declined. This oriental style beach was short lived, however, for on July 20, 1929 fire destroyed all but the little office building. 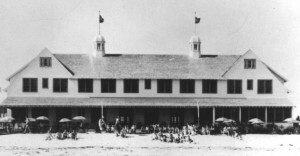 This building was later moved to an oceanfront lot on West Boardwalk and served as the summer residence of the beach managers for many years. Today it is a private residence and is known as the Pagoda House. It is the oldest documented structure in present day Atlantic Beach. In the autumn of 1929 the great depression occurred and the owners of the Atlantic Beach property defaulted on their loans. The property finally ended up in the ownership of the Manufacturers Bank and Trust Co. of New York. The company sent Robert Cordon down to review the property for a possible reconstruction of the development. Upon receiving a favorable report from Cordon, the officials of the company formed a new corporation, the Atlantic Beach and Bridge Company to rebuild the resort proper and operate the bridge. The bridge was a toll bridge from its opening and remained so until sold to the State of North Carolina in 1934. Two new bathhouses, a dance hall named the Casino, and several assorted drink stands were built in 1930, and the beach reopened for business. 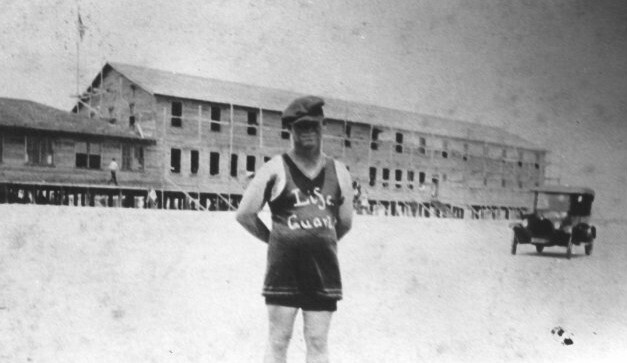 In the fall of the following year construction was begun on the Atlantic Beach Hotel on the site of the present Crab’s Claw and Town Beach Access. 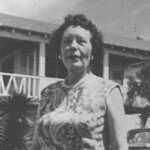 At that time Newman Willis, who had worked at the resort since it opened in 1928 and was later to become the town’s first mayor, was hired as caretaker of the new hotel. In November of 1931 he and his new bride, “Miss Etta”, moved to Atlantic Beach and became the first permanent residents who stayed. They spent the first year in the little office building that had not burned, since the hotel was still under construction. 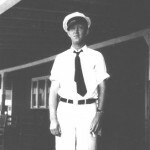 In 1934 their son, James N. “Cap’n Jim” Willis III, was born, and he became the first person to call Atlantic Beach home from birth. During the thirties the tract of land surrounding the “circle” was platted with lots and streets extending out to the east and west of the “Circle”. The streets running east and west were called Boulevards and named for local geographical features, and those running north and south were called Avenues and named in honor of towns and cities in North Carolina. Lots were sold, and in 1932 the first cottage in the new “Atlantic Beach” was built by Ed Batchelor from Greenville, N.C. on the lot just west of the future Seashore Club. Cottages were also built in Money Island Beach in the 1920’s and 1930’s, but we are not sure of the dates of construction of those that remain. The Batchelor cottage was destroyed by fire along with the Seashore Club many years ago. A boardwalk was also constructed along the oceanfront from one end of the property to the other. In front of the “Circle” the boardwalk was wider than the east and west portions and the planking ran parallel with the ocean shoreline. In the spring of 1940 the boardwalk here was rebuilt and the planking placed perpendicular to the shoreline. Thus old photos of the “Circle” during this time period can be dated pre or post 1940 by the orientation of the boardwalk planking.